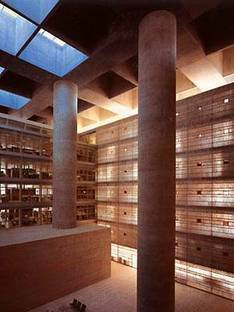 In 1992 the bank corporation Caja General de Ahorros held a competition for construction of its new head offices in the southern part of old Granada, fresh from monumental development which has doubled the surface area of the Spanish city in a very short time. The project was entrusted to competition winner Alberto Campo Baeza, who wrote a new chapter in his career focusing on continuous investigation of the modulation of light and study of elementary typological schemes. In harmony with his earlier work, Campo Baeza reinterprets the tradition of the past, returning to the theme of the Renaissance palace with its inner courtyard, specifically the palace of Charles V built in the Alhambra. The whole bank complex takes up the square form of its plan, on which it imposes a reinforced concrete structure supported by four enormous hollow columns, like the huge pylons of bridges, on which a dual horizontal beam system rests. The basic cage follows an extremely simple, linear scheme, a module measuring 3 x 3, which appears again on the south-facing façades, in which cubic units create a strong effect of depth, with a system of brise soleils for protection from the sun, while the northern façades are characterised by structural lattice-work of reinforced concrete punctuated with three-part window and door frames and travertine slabs. The structure incorporates two bodies built of light metal structures containing offices; their L-shape and corner arrangement creates a central courtyard and a catercornered one cutting across the entire building. The more southerly of the two corner bodies is 15 metres deep and contains open space offices, while the other is smaller, 9 metres deep, with offices opening up one at a time off a single connecting route along the courtyard. The courtyard plays a very important role in the complex, just as it did in the old Renaissance palaces; the basic ideas behind the project are developed around the courtyard space, whose role as a central core is strongly reinforced by the use of light. Campo Baeza uses light as a true element of construction, making it the driving motor and pulsating heart of the entire building. It is through light, filtered by the system of glass skylights which finally replaced the perforations in the roof appearing in the project submitted for the competition, that the courtyard space has life and takes on its dominant role in the structure.